The second in my series of images shot on my way home to Oklahoma, this one was in Beatrice, Nebraska, looking east from where Highway 77 crosses the Big Blue River. If you click on that link it will load the Google Maps Street view of this scene which, as you might notice, is vastly different in terms of lighting and overall colorization compared to what you see here. Just like last week’s image the weather here was overcast and drizzly, and since I had driven over this bridge many times in recent years I certainly wasn’t expecting to stop and take pictures. But as I crossed the river and looked off to the west I realized that the scene could make for an interesting photo opportunity. Whenever I’m driving solo I have to balance the time I spend driving with the time I spend stopping, and all the little 5- and 10-minute respites to take photos can really add up and have the unfortunate side effect of stretching a 6.5-hour drive into an 8-hour drive, and that was certainly on my mind here. Was this bridge really worth stopping for? I didn’t know for sure, but after I parked my car in a nearby lot I literally ran over to the spot where I shot this photo so I could make this little side jaunt as brief as possible. I had my D750 and 70-200 lens and as I took a few images I quickly realized that it wasn’t necessarily the old rail bridge that was going to make for an interesting picture but also its reflection. Somehow that seemed to add a unique element to the photo, so I zoomed out and took a few more pictures at about 75mm which is what you see here. In thinking about this image after the fact I realized that this same photo could have been taken with my Nikon D200 and 50mm lens, since the focal length I ended up using on my full-frame camera is very close to shooting 50mm on a crop-sensor camera. Basically, even though I was shooting with a couple thousand dollars worth of camera gear I could have done the same thing with a camera/lens combination one-tenth the price. It was a healthy reminder to me, even after all these years, that good pictures don’t require fancy cameras or expensive lenses. Certainly those elements can help, but often it’s just seeing the opportunity for a picture and then taking the time to capture it that really makes all the difference. What a lovely shot! And, the reflections certainly made the shot lovelier. Awesome shot, Simon! That bridge is a historical landmark! 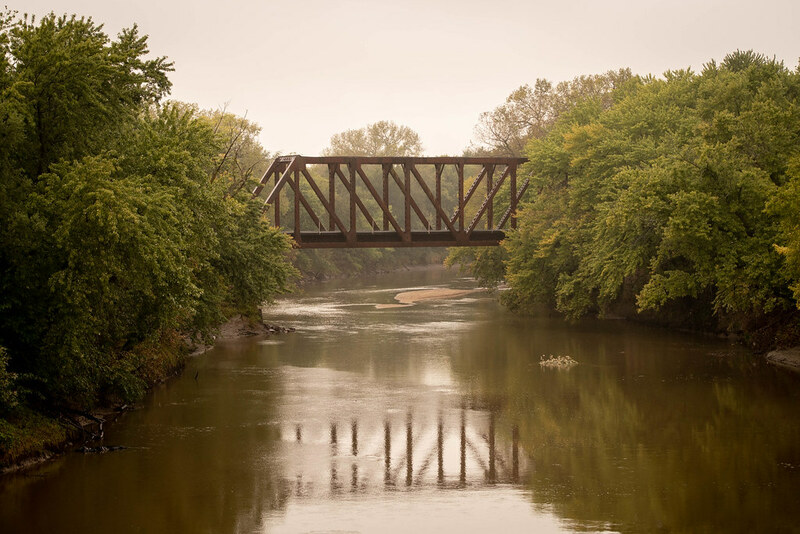 Did you know the Blue River always floods down in Shataqua Park on the southside of Beatrice? And back in the day, the owner of Rosie the elephant used to take her down to the Blue to take her weekly baths. Beatrice is my mom’s hometown! I’m so happy you decided to stop. Bridges like this are disappearing from the countryside. You have recorded a peaceful scene as well as a bit of history. Thank you. I also appreciate your comment re: your “big boy” camera and the crop sensor. I shoot with a crop sensor and I’m often envious of the full frame images I see. A “big girl” camera is on my wish list, but until then, I’ll keep shooting and loving it!